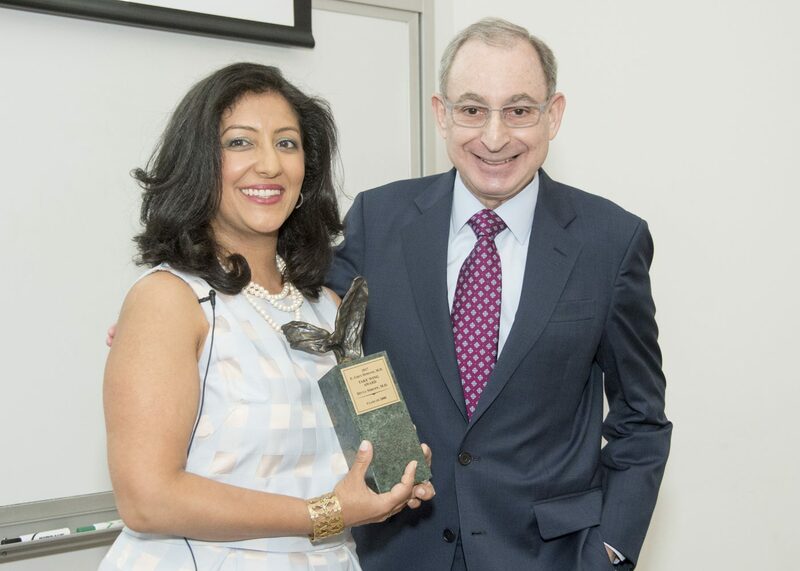 Divya Shroff, M.D., ’00, F.H.M., with School of Medicine Dean Steven Kanter, M.D., received the 2017 E. Grey Dimond, M.D., Take Wing Award on Monday, May 22. When word reached Divya Shroff, M.D., ’00, F.H.M., that she had been selected as winner of the 2017 UMKC School of Medicine E. Grey Dimond, M.D., Take Wing Award, tears filled her eyes. Her colleagues would beg to differ. Having worked at two of the largest health care systems in the United States, Shroff has grown into a nationally recognized leader in bringing together medicine and technology to improve the quality of patient care. Today, she is also responsible for the strategic leadership and oversight of a staff of nearly 1,800 physicians and advanced practitioners as chief medical officer of TriStar Centennial Medical Center, in Nashville, Tennessee. With that comes the duty of maintaining the highest standard of quality and clinical excellence for the flagship hospital of the nation’s largest for-profit health care corporation, Hospital Corporation of American (HCA). It’s a goal that Shroff and her team have consistently met since she took on the physician leadership role in 2013. For the past five years, the hospital has earned an A+ rating for quality and safety from the Leapfrog Group, a national nonprofit organization that reports on hospital performance. “It’s a very busy clinical facility and we want to make sure we’re meeting the quality standards,” Shroff said. 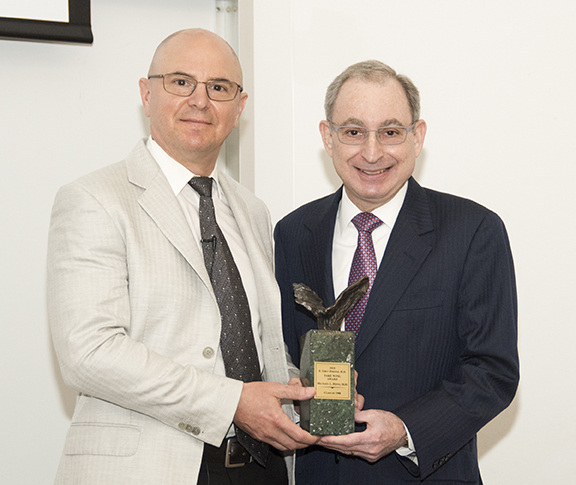 Shroff received this year’s Take Wing Award at the annual Take Wing Lectureship on Monday, May 22, at the School of Medicine. Before her appointment at TriStar Centennial, Shroff joined HCA’s clinical services group as chief clinical transformation officer and vice president. The role made her responsible for implementing electronic health records systems throughout the corporation’s more than 170 hospitals. Only a small fraction of those were using electronic health records when she arrived. Within a few years, all HCA hospitals across 20 states were on board. Shroff began building a resume as a physician leader and medical technology innovator at the Veterans Administration in Washington, D.C. She said she honed her skills by knowing and working closely with the folks in the IT department. Developing those relationships were important, as she played a vital role in projects such as using a Blackberry — before the days of the iPhone — to transmit EKGs to off-site cardiologists, developing an electronic providers hand-off tool, and implementing an interactive bedside TV for patients that communicates with the hospital’s electronic medical records system. She said her time at the UMKC School of Medicine helped her build the skills necessary to be successful. She said the experience teaches young physicians to take ownership of becoming outstanding patient care providers. “What has allowed me to be successful in my role today is the foundation that I got from the UMKC School of Medicine,” Shroff said. Now, part of Shroff’s task is to share that charge of maintaining the highest quality of patient care with the medical staff of a large, full-service community hospital that’s about to embark on a $120-million expansion. Leaders at TriStar Centennial are also exploring the idea of adding a graduate medical education program.